It looks and sounds absolutely beautiful! Beautiful! Worthy of that drive. Your photo is WONDERFUL! We are close enough to visit those mountains when we need a vacation - love to look out the window and catch a breathtaking view! Count me in for the field trip when the scenery is this lovely. Gorgeous photograph. Can't wait until Friday. What a magnificent shot that is! I'm still saying "WOW!" We'll be heading to Yosemite for our yearly camping trip in a couple more weeks. just driving with no planned destination has always, without fail, turned into the most beautiful of experiences for me. I love road trips like this. And I'm glad the meal was worth the anxiety (for a bit). I've been to Stanton and loved the drive up from Charlottesville. 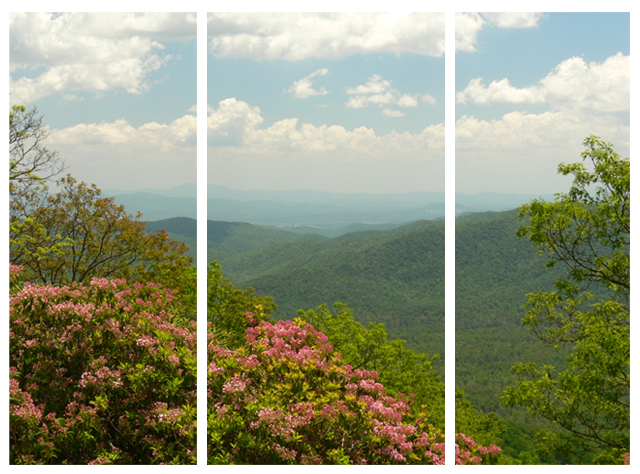 The blue ridge mt parkway is my favorite drive! Enjoy your trip! Gorgeous shot! I can't wait to see more pics! love a road trip and a sunny weekend. Love that photo...and the triptych style!! !